Last week, our Marxist Feminist study group assembled some offerings for a care package. A comrade of ours in LA (close friend to some, known through her work to others) has been going through a difficult time lately, and we wanted to send a small token of appreciation for her strength, amazing organizing work, and general fabulousness. 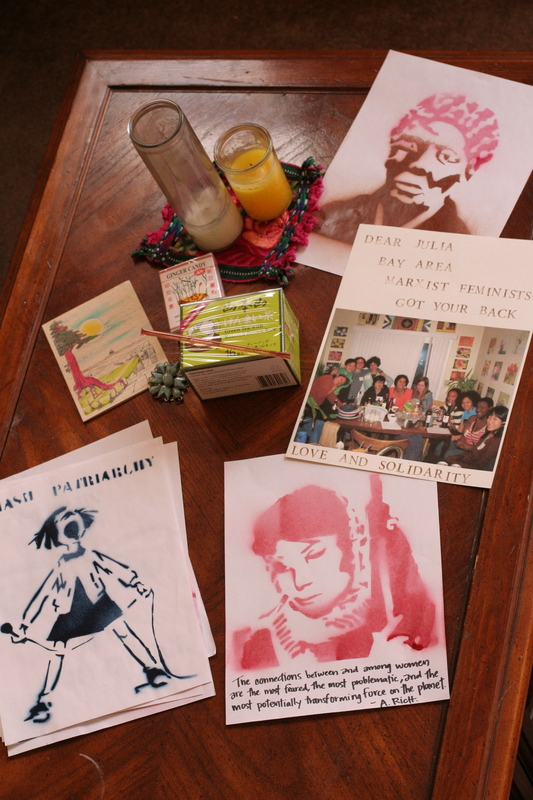 Handmade stencils, a card, a poem, ginger candy, green tea with a honey stick, a necklace pendant, and a hand-stamped group photo from our inter-state Marxist Feminist gathering a few months back. The finishing touch will be a batch of cookies I’ll bake up tomorrow. Care packages! A personal favorite. this should be organization building 101 — showing collective/group expressions of love and care for comrades going thru hard times! Hi comrades- I am so moved by your package and the thought, time and effort that went into making it and baking it. :+) Those cookies were gone with the quickness (delicious!) and that ginger candy was what I ate to help calm my nerves. Probably undenounced to you I had been organizing a press conference for the rights of immigrant women and recieved your package two days before! I faced a lot of opposition and so members of the coalition I think didnt show up because they were unhappy about the press conference becasue 1) They think women’s issues are a distraction to the “workers” issue(?!) and 2) because they didnt think of it first (haha)! Getting the package boasted my energy and gave me strength! Thank you thank you! The press conference was a success ! Attended by around 50 people on the corner of 6th and Union in Pico Union/MacArthur Park. Men were there in total solidarity and cheered women as we represented at the press conference. I think the gender ratio was about 30 women and 20 men. Unlike many press conferences organized by the left in LA because the majority of the women were working class the community were curious and cheered it on! Men came up to us with friendly curiousity-” Las mujeres organisan? Esta bien” . A man with a baby in his arms and another holding his hand expressed his solidarity. Comrade Eduardo was passing out flyers to a two women who passed by curious about the event. He explained the event to them and then one of htem said, ” Oh yeah, I am a victim of domestic violence” and then to her companera said, ” Hey Vita-let’s go over there and talk to the press about it” and they DID! The corner of 6th and Union has political signifigance. On that spot a year ago a Guatemalan immigrant Manuel Jamines was murdered in broad daylight by the Rampart division of LAPD. There was an uprising for three days! Women were in the streets. I remember one incident where a women holding her child screamed “Asecinos” which means murderers in Spanish to the cops as they walked by. Powerful image. Thank you for caring for me personally and showing me solidarity!